A Professor of Pharmacognosy, Maurice Iwu, whose publication about the potency of Garcinia Kola (Bitter Kola) in reducing the replication of the Ebola Virus has become popular since the outbreak of the disease, has reiterated that the Bitter Kola is not a cure for Ebola, as rumoured in some parts of Nigeria. Since the outbreak of the Ebola Virus Disease in Nigeria in July, Bitter Kola has become a commodity that many Nigerians want to have in their pockets or bags and eat it at intervals, as a result of the rumour that it could cure Ebola. 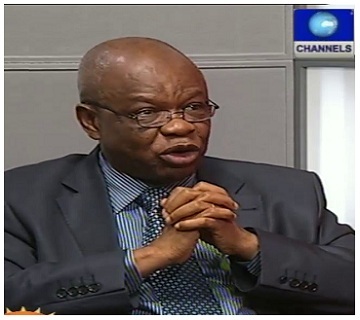 Professor Iwu had, in an article published in 1999, established that Garcinia Kola had a compound, Kola extract, that was able to arrest the replication of the Ebola Virus. “It was not a cure but that was a big hope because it was just five years after Kikwit, a province in Congo had cases of Ebola outbreak. “We were so happy about it and when I was given an award in Saint Louis Missouri, the entire hall came to a halt when we announced that this compound is able to do this. “Before then, there was nothing of such and there was not even an animal that we know that can withstand the virus,” Professor Iwu said. He, however, stressed that the research, carried out by a group established in 1985, interested in disease hunting, also showed that Garcinia Kola had the ability to boost the immune system which was necessary to boost an Ebola patient’s chances of recovery. On Monday, four more patients with the Ebola Virus Diseases were discharged after they were certified okay by a medical team handling the treatment of infected persons. It is a breakthrough as five persons have so far been discharged while four deaths have been recorded. Professor Iwu, who is a member of a committee set up by the Minister of Health, Professor Onyebuchi Chukwu, to advise the ministry and medical workers on the Ebola outbreak, described the development as a positive one. “Something positive is happening and that shows that our chief medical doctor, Professor Chukwu, his team, the Lagos State doctors and the Lagos State government are doing their best to contain the spread of the disease. “The proactivity that Nigeria has shown is commendable. In the containment, they are doing very well. In the issue of treatment, they are doing very well so it is a hopeful sign,” he said. Professor Iwu stressed the need for a little change in the approach of medicine from the point of view of treatment and disease to accommodate the non-western concept. “The process where you now need to strengthen the body system with natural immune boosters should be looked at and the Garcinia Kola is interesting in that regard. “What is worst with Ebola is that drug development has what is called phase three, which is the stage it is approved. It is not possible to have a scientifically valid phase three trial for Ebola because you do not have enough patients at any given time to administer the drug on. “Even at the moment, Africa does not have enough patients. You have to plan the phase three, you will have to recruit the patients and make sure that all the parameters to use are available. He said that Africa was suffering from a severe case of low self esteem, pointing out that “if the survival of the four Ebola patient was in America they would have been going round, preaching and telling people how to manage Ebola cases, giving seminar and sending whatsapp messages”. “But in our continent, it will be all negativity and it is an enclosure of the mind for somebody to look down on alternative sources of treatment,” the Professor of Pharmacognosy said. He insisted that people who criticise alternative medicine do so because they want to discourage people from seeking alternative sources so as to sell their products.